A good fireplace or stove requires good ventilation piping as well, and Majestic supplies both exceptional stoves and fireplaces as well as the supplementary products needed to maintain your system. The Majestic SL306 6 inch Chimney Section - 8 Inch Diameter is everything you need in a chimney vent pipe length; it is both durable and efficient. The rugged 3 lb. build is made to last and ventilate your combustible stove more efficiently. The 6-inch section is effective, but it won't impinge on the look of your roof, and the 8-inch diameter is compatible with piping of the same size. A good fireplace or stove requires good ventilation piping as well, and Majestic supplies both exceptional stoves and fireplaces as well as the supplementary products needed to maintain your system. The Majestic SL312 12 Inch Chimney Section - 8 Inch Diameter is everything you need in a chimney vent pipe length; it is both durable and efficient. The rugged 4 lb. build is made to last and ventilate your combustible stove more efficiently. The 12-inch section is effective, but it won't impinge on the look of your roof, and the 8-inch diameter is compatible with piping of the same size. A good fireplace or stove requires good ventilation piping as well, and Majestic supplies both exceptional stoves and fireplaces as well as the supplementary products needed to maintain your system. The Majestic SL318 18 inch Chimney Section - 8 Inch Diameter is everything you need in a chimney vent pipe length; it is both durable and efficient. The rugged 6 lb. build is made to last and ventilate your combustible stove more efficiently. The 18-inch section is effective, but it won't impinge on the look of your roof, and the 8-inch diameter is compatible with piping of the same size. A good fireplace or stove requires good ventilation piping as well, and Majestic supplies both exceptional stoves and fireplaces as well as the supplementary products needed to maintain your system. The Majestic SL336 36 inch Chimney Section - 8 Inch Diameter is everything you need in a chimney vent pipe length; it is both durable and efficient. The rugged 11 lb. build is made to last and ventilate your combustible stove more efficiently. The 36-inch section is effective, but it won't impinge on the look of your roof, and the 8-inch diameter is compatible with piping of the same size. A good fireplace or stove requires good ventilation piping as well, and Majestic supplies both exceptional stoves and fireplaces as well as the supplementary products needed to maintain your system. The Majestic SL348 48 inch Chimney Section - 8 Inch Diameter is everything you need in a chimney vent pipe length; it is both durable and efficient. The rugged 14 lb. build is made to last and ventilate your combustible stove more efficiently. The 48-inch section is effective, but it won't impinge on the look of your roof, and the 8-inch diameter is compatible with piping of the same size. Majestic ventilation piping is just as reliable as one of their stoves or fireplaces, but that is the quality that Majestic consumers have come to expect since 1993. The Majestic SL315 15 Degree Offset and Return Elbow - 8 Inch Diameter provides a middle-sized option for those looking for ventilation elbow piping to add to their system. The 15-degree angle helps you efficiently use ventilation piping in hard-to-reach, angular sections, and the Offset and Return Elbow are both included in this kit. The unit weighs 8 lbs. and is intended to last for years. Use the Majestic vent pipe elbow for efficient ventilation today. Majestic ventilation piping is just as reliable as one of their stoves or fireplaces, but that is the quality that Majestic consumers have come to expect since 1993. The Majestic SL330 30 Degree Offset and Return Elbow - 8 Inch Diameter provides a middle-sized option for those looking for ventilation elbow piping to add to their system. The 30-degree angle helps you efficiently use ventilation piping in hard-to-reach, angular sections, and the Offset and Return Elbow are both included in this kit. The unit weighs 9 lbs. and is intended to last for years. Use the Majestic vent pipe elbow for efficient ventilation today. Firestops make it possible for you to enjoy a Majestic stove with a vertical flue in safety. A firestop alone doesn't solve all of your problems, though, and the Majestic FS 338 Straight Firestop Spacer makes it possible for your fireplace flue to run up through different floors of your home or even an attic without endangering the floor at each level. This firestop spacer is intended for vertical 8-inch flue pipes, and the kit includes vent pipe support pieces. Keeping your ventilation pipe properly spaced from combustible materials is vital when installing a vertical flue, and Majestic's Straight Firestop Spacer with an 8-inch diameter gets the job done. The Majestic WS30 30-degree Wall Firestop Spacer helps to separate your chimney piping from the interior of the walls of your home. As the hot exhaust makes its way through the chimney pipe, the pipe heats up very quickly-as you can probably imagine! It's best to keep that hot chimney pipe away from the interior of the walls of your home. That's where the firestop spacer is helpful. For over a decade, Majestic has helped to keep homes safe while homeowners enjoy cracking fires in beautiful fireplaces. They provide products-like this one-that can be used with both wood-burning and natural gas fueled fireplaces. The benefits of a roof flashing are well-known; they are a commonly used piece of equipment for keeping the effects of severe weather out of your chimney and ventilation system. The Majestic RF370 0/12-6/12 Pitch Roof Flashing - 8 Inch Diameter goes one step further, however, because the angle of the pitch will ensure that water washes right off the flashing, and snow won't accumulate to the same degree as a flat flashing, which makes for a drier roof. This 28 lb. roof flashing is rigorously built to last and is compatible with a vent pipe termination of 8 inches. If you live in an area frequented by rain storms or snow in the winter, weather-proofing your home is a good step to take. This Majestic TR342 Round Telescoping Terminal Cap with Storm Collar is a great option for your home's chimney exit. The TR342 model includes both the cap as well as a storm collar. Placing the storm collar around the cap is an extra measure to ensure that no water makes its way between your chimney termination and roof. Your attic is kept dry and your stored belongings as well as your home are both happy and dry! Is it time to replace the termination cap at the top of your chimney? Or perhaps you're building a new fireplace and chimney. For over a decade, Majestic has provided quality products for customers who are installing fireplaces and hearths into their homes. This Majestic TS345 Square Termination Cap is no exception! This specific model is designed to be used with chimney piping that is 8 inches in diameter. The square surface will prevent falling debris, rain, and other items from entering your chimney and falling into your fireplace. It will also protect your roof from the hot exhaust that comes out from your chimney as you burn wood or natural gas. Is it time to replace the termination cap at the top of your chimney? Or perhaps you're building a new fireplace and chimney. For over a decade, Majestic has provided quality products for customers who are installing fireplaces and hearths into their homes. This Majestic TS345P Square Termination Cap is no exception! This specific model is designed to be used with chimney piping that is 8 inches in diameter. The square surface will prevent falling debris, rain, and other items from entering your chimney and falling into your fireplace. It will also protect your roof from the hot exhaust that comes out from your chimney as you burn wood or natural gas. As a wood burning fireplace unit under the Designer series, this item takes the traditional style to a whole new different level. This unit comes with an elegant style which makes it possible to have an expansive view of the fireplace alongside its exciting design applications. It comes with refractory brick interiors and standard radiant design, making it rival its masonry counterparts, and still be able to showcase a sophisticated option of the wood fire's natural beauty. Aside from focusing only on the design, this model is also equipped with features that are surely amazing for your taste and preferences. How much does the 36" fireplace weigh? This unit approximately weighs 240 lbs. 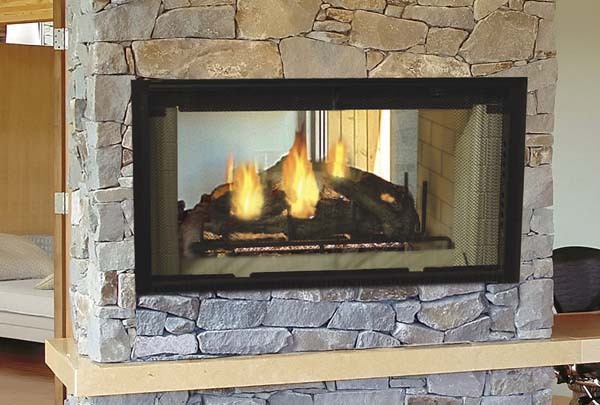 Can you mount the MAJ-DSR36 one side to a wall and make it a peninsula fireplace? No, the Majestic Designer series models such as the DSR36 cannot be converted to a peninsula style. Is this model EPA compliant? This unit is not EPA compliant. Unfortunately, we do not have any see through units that are. This fireplace itself measures 24" in depth, but the framing depth for the wall between two rooms would be 23", as shown on page 12 of the installation manual. What is the vertical height of the firebox? What is the clear opening width? Hi Eric. Sorry for the incomplete answer there. The Required Framing Height of this unit is 41 1/2". The Firebox Opening Height is 20 7/8". The height from the floor to the flue outlet is 47 1/4". You can also refer to page 9 of this unit's owner's manual for more information. This model is a DSR36. I have seen another model, the STR36. Are these the same product? Is one a newer version of the other? Or, are the dimensions slightly different? Thank you. Yes, this DSR36 is the newer, updated and current model that replaced the old Designer see-thru series. There are different dimensions and the unit also uses a new type of class A chimney system. Is there an electronic ignition or auto light for this fireplace or a thermo-damper? There is no electronic ignition option for this unit as it is a woodburning fireplace. There is a built-in damper on the unit.